Which makes sense considering Valentines Day is coming up! 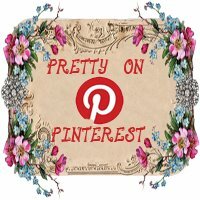 Pretty on Pinterest is hosted by Simply Stacie and Sassy Mama in LA . Be sure to check out all the other great posts! Do you have a Pinterest themed post up this week? Wow Tara you had some good finds! I love them all but my fav is the 'I dig you' gift! How cute!! I'm obsessed with Pinterest and I didn't know about this link up. I'm going to check them all out!